Dealing with ‘inconvenient’ people is one of the Government’s main talents. Upset somebody important and you will be made to suffer. It is only the form of punishment that is to be decided, according to who you are and what the Government imagines you will do to save yourself. Last week, it was the turn of Anuruddha Pradeep, a lecturer at the University of Sri Jayawardenapura. Pradeep was sacked for not completing his Masters within the specified amount of time after his appointment. Except that the only thing standing between him and the completion of his Masters is the university, since he has submitted his thesis and is waiting for them to approve it. Indeed, he submitted it nearly three months ago. Every other lecturer in this position – probably in the entire history of the university if not also throughout the university system in Sri Lanka – is granted a temporary appointment until the matter can be sorted out. Once their thesis is approved, their permanent appointment is backdated to the date of submission. Even people who haven’t finished their research are granted this facility, since it is commonly accepted that universities should help their young researchers to develop their capacities, rather than obsessing over deadlines. Given the difficulties in retaining talent, this is understandable. The Government is desperate to encourage the thousands of academics who have left the country in despair at the state of the university system to come back, to establish its as yet purely imaginary ‘knowledge hub’, so why does it want to get rid of Pradeep? To facilitate his removal, the university has even stooped to the level of falsifying the submission date of his thesis in the papers the Vice Chancellor presented to its council meeting. Why go to such lengths? Because the Minister of Higher Education is obsessed with establishing private universities, and Pradeep has consistently and very effectively raised doubts about the policy and the manner in which it is being implemented. Of particular importance is the Malabe Medical College. Towards the end of last year, Pradeep and FUTA president Nirmal Ranjith Devasiri, together with Dr Sankalpa Marasinghe and Dr Upul Gunasekara of the GMOA, filed a fundamental rights petition against SB Dissanayake regarding the Malabe Medical College, otherwise known as the South Asian Institute of Technology and Medicine. Curiously, when it was established in 2008/9, it was called the South Asian Institute of Technology and Management. At least they both start with an ‘M’. The Board of Investment approved the project on the condition that the approval of both the Sri Lanka Medical Council and the Ministry of Health would be obtained prior to starting any courses related to health, but they are yet to get around to that ‘detail’. They are also yet to fulfil any of the targets included in the gazette notification issued by the Ministry of Higher Education when it granted the Malabe Medical College the right to award degrees under the University Grants Commission. In any case, it is not clear whether this gazette notification was legal, since the rules of the University Grants Commission require the approval of the relevant professional body for all of its courses, and this has not been given. Silly doctors, not yet convinced by SB Dissanayake’s master plan. How very irresponsible of them, for example, to think that medical students should be trained in an established hospital so that they can see for themselves how the most important ailments in Sri Lanka present and gain experience of treating actual patients. The Malabe Medical College has managed to turn out seven batches of young people without troubling itself with such concerns. The case was dismissed by the Supreme Court on the grounds that it was brought more than a month after the gazette notification, but the petitioners argue that the violation is ongoing and progressive in nature, albeit having begun some time ago. They also stress the fact that the issue is of widespread public interest, in the sense that it affects the two vital social services of health and education. It would certainly seem to indicate how ineffective regulation of private universities is likely to be. Pradeep has written a very useful book on private universities (‘Private Universities: Fashion and Reality’, Ravaya Publishers 2011) that explains the likely fate of the university system if SB Dissanayake is allowed to continue his crusade unchecked. He has studied the situation in other countries, concluding that many have no or very few private universities (e.g. the UK), while in places where they are common they are often almost exclusively not-for-profit institutions (e.g. the US). Where for-profit institutions are significant, a strong oversight mechanism is essential to prevent corruption. But SB Dissanayake is confident that corporations – both domestic and foreign – have people’s best interests at heart, so why all this fuss? It’s only education and health. These were among the issues stressed by FUTA during its three month long strike last year, and Pradeep was one of its more visible participants. The Minister of Higher Education made his displeasure absolutely clear in an article in Lakbima, in which he announced that ‘Pradeep can be expelled from the university any time’. How exactly, when universities are supposed to be autonomous? Well, SB Dissanayake has packed their councils with his supporters, including both his relatives and people eager to set up private universities. At Sri Jayawardenapura, the Minister of Higher Education appoints nine members, while eight come from the university. Even the university representatives are under tremendous pressure. FUTA has issued a media statement condemning the dismissal of Pradeep, complaining of political interference. It says that it has received reports from several other universities of similar incidents, especially in the North and East. Perhaps the willingness of Pradeep to come forward and challenge his treatment stems from the fact that he is also an office-bearer of the JHU, giving him some protection from the full weight of the administration. He is fortunate. If he were a member of the TNA, he would have been labelled a Tiger and that would have been the last of him. According to FUTA, political interference in the university system is now reaching unprecedented levels, as Shanie reported in these columns on Saturday with special reference to recent developments at Peradeniya. The one thing that the Government is absolutely committed to is getting its own way. It doesn’t matter what you do, only total commitment to its goals and to the specific objectives of its key personalities will be enough to keep you out of trouble. Something has gone to Mahinda Rajapaksa’s head, and I’m guessing it’s power. Because that seems to be the only thing that interests him these days – how to bolster his own position and how to undermine everybody else’s. Hence his first priority after the end of the war was to get himself another term as president. The presidential election was called early, and it was followed within a couple of months by a parliamentary election, enabling him to strengthen his grip on the legislature too. The Opposition was in disarray. But that wasn’t enough. He wanted a two thirds majority, so a few more crossovers had to be engineered. Neatly bringing us to priority number two – legislation to reduce checks and balances on the executive, and to enable him to run again, as many times as he finds convenient, by abolishing term limits. The Constitution was changed. And it was ‘urgent’. Naturally, for what could be more important than Mahinda Rajapaksa’s future? Not peace-building, certainly. That’s for wimps. The third and final priority was to keep the Opposition cowed. Which is why he has called one election after another, to keep them in campaign mode so that they never get around to replacing their has-been leader. The actual running of the country has suffered. But that needn’t matter if people learn to be satisfied with the mere appearance of achievement rather than the real thing. What matters is announcing that resettlement is complete and Manik Farm closed down, right? Not whether the IDPs are actually back home with roofs over their heads. Get with the programme, folks. The Government isn’t bothered about ‘details’ like that. After all, it won the war – nothing else matters. It certainly doesn’t matter that university teachers have been on strike for three months. Never mind that such a massive and sustained trade union action by a normally rather conservative group of people is unprecedented in Sri Lanka. What matters is not giving in to terrorism. Sorry, did I say terrorism? I must be getting confused – the modern world is so difficult for those of us with only limited intelligence. It’s academics Mahinda Rajapaksa shouldn’t negotiate with, right? The FUTA struggle presents us with a crystal clear picture of the Government’s post-war failings. The debate has exposed just how little substance there is to the grandiose vision that was set out in Mahinda Rajapaksa’s much-hyped Chintana. He wanted Sri Lanka to become a knowledge hub, for people to flock to its universities from around the world and for them to turn out graduates prepared to transform the country into the ‘Miracle of Asia’. But Mahinda Rajapaksa appointed a man with half a brain to make it happen. SB Dissanayake had only one idea for the development of universities – put a stop to ragging. Because this is how he managed to spend four years at the University of Sri Jayawardenapura following a degree in ‘public administration’ without learning even the basics of how to minister to a government department? I guess not. It was training in how to be a politician he was after those days, for which purpose I imagine ragging was very helpful. Who knows. Wiping out ragging is a pretty simple task. And as a ‘bonus’, it can be linked up with the further militarisation of society by making young people eager to discover the origins and meaning of life in the universe march around in circles and learn how to salute. A no-brainer, in other words. Anything else would no doubt turn out to be a bit tricky, the Minister may have thought, so it had better be left to the private sector. At least that would bring in some money. I have already discussed the follies of the Private Universities Bill in these columns, so I will not bore readers by repeating myself, except to say the following – companies may provide the kind of education that students think will get them jobs, but they have absolutely no incentive to do anything more. Now, ragging is a waste of time (and worse) that certainly ought to be stopped. But stopping it falls rather short of being a comprehensive plan for the creation of a knowledge-based society in Sri Lanka! When confronted with other people’s ideas, the Minister hasn’t demonstrated a lot of patience. Indeed, his response to the FUTA struggle has mirrored the Government’s reaction to any and all criticism, displaying a totally absurd war mentality. SB Dissanayake alternates between claiming that the demands of the university teachers are unreasonable, if not downright sinister, and saying that they have already been met. 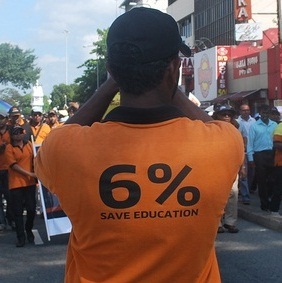 Take the call for the Government to spend 6% of GDP on education. According to SB Dissanayake, this is a random figure dreamt up by Nirmal Ranjith Devasiri over his morning tea, with short eats provided by the Opposition, NGOs or most imaginatively Prabhakaran’s ghost, all to make trouble for Mahinda Rajapaksa. However, it is actually a globally accepted norm. What’s more, it is a target that the Government along with its counterparts in many other countries, including the whole of South Asia, has committed to reaching. The only person who thinks it is not important is the responsible minister in Sri Lanka. Adding insult to injury, he then manages to claim both that public expenditure on education is already nearly at 6% and, in his very next utterance, that it need never be anywhere near 6% since Sri Lankans are already very well-educated. What a propaganda machine! The figure of 1.9% was calculated by the Government. The last time the UK allocated such a tiny proportion of GDP for education was during the First World War – it currently spends 6.1%. Think of all the extra ministers we could have if only we realised that 1.9% was enough for countries with near universal literacy! Maybe SB Dissanayake would agree to look after our universities once he has finished ‘revitalising’ the ones in Sri Lanka. We could do with some help with our trade union movement. But coming back to the point, it is official statistics that UNESCO includes in its global database (www.uis.unesco.org). FUTA has nothing to do with it. Rummaging around in the national income accounts to find some other vaguely associated spending to add to the 1.9%, as SB Dissanayake sometimes advocates, is simply not credible. When the Minister is in a mood to accept that Sri Lanka does indeed spend only 1.9% of GDP on education, he is keen to point out that increasing the allocation would take up an impractically large share of government revenue. How thoughtful! Like any good housewife, he is keen to keep expenditure within income. Will he also offer to give up his perks in the national interest? Don’t hold your breath. But of course the economy doesn’t function like a household – increasing government expenditure can generate more income. The share of government expenditure, which is the only relevant figure, wouldn’t have to be unduly large either, since government expenditure could be increased to meet the 6% target. But enough with the ‘details’, right? SB Dissanayake would rather waste our time (or worse) calling the leaders of the FUTA struggle names, trying to make us suspect their motives. Smear tactics are the bread and butter of the Government. Its objective is not to find a solution to the problems in universities, but to hang on until academics have to give up their strike – three months is a long time to go without salaries. It simply hates to lose. And winning has come to mean sticking to a position, whatever happens. Mahinda Rajapaksa should be ashamed of himself for losing track of what is truly important. He did Sri Lanka a tremendous service by putting an end to the generation long war, for which the vast majority of people are extremely grateful, even if they do not approve of each and every action taken in the process. He amassed massive political capital. And he was, and indeed still is, in a position to do even more good for the country. Sri Lankans waited a long time for peace, not only to escape the relentless death and destruction but also because so many things were excused or put on hold because of the war. They have a long list of priorities, none of which it seems Mahinda Rajapaksa can be bothered to tackle now that he has ensured his own place in the history books. A change of attitude at the top is required. This article was published in the Midweek Review on 10th October 2012. The internet version can be accessed here. Perhaps the most important is the Private Universities Bill, legislation that is being pushed for the purpose of attracting investors – foreign and domestic – into the education system. The Government seems to think that there’s no difference between training a country’s doctors and providing its citizens with a range of attractive footwear – the profit motive will act as both an incentive and a guarantor of standards. The fact that this is not the case anywhere in the world doesn’t seem to matter – many countries have very few private universities (e.g. the UK), while even in places where private universities are common, they are often almost exclusively not-for-profit institutions (e.g. the United States). Where for-profit institutions are significant, a strong oversight mechanism is needed to prevent corruption. I don’t know if the Government is responsible – maybe it’s just an extraordinary coincidence that the targets all constitute some kind of challenge to the administration? Herman Kumara, convenor of a national organisation of fish workers, came under threat after protests against the hike in fuel prices in February 2012. These were actually spontaneous, since the fishing community wasn’t exactly thrilled to see the cost of their main input go up by nearly 50% – genuinely ‘unusual’ – but the Government decided to blame Herman. He is a prominent activist in the area where the main protests took place and on issues related to the fishing community. The Government knows him well, since his organisation often puts forward suggestions for the development of the sector. Facing strong criticism from both within and outside the country due to the shooting of a protestor, the Government announced that it was all an NGO conspiracy. 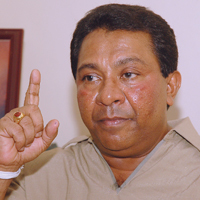 Rajitha Senaratne named Herman. Of course what the Minister should have done was name the Special Task Force. Or maybe the IMF. In the end, it was the Government that had decided to increase fuel prices and the Government that had failed to manage the reaction this generated. University teachers are lucky that their trade union president has so many individuals and institutions willing to back him up, to stand up for their right to disagree. They are engaged in an important struggle, and they should continue with it. In addition to ensuring the future of higher education in the country, FUTA must teach the Government that it cannot rely on intimidation to get its way, and that it must act to forever banish the climate of fear that continues to envelop Sri Lanka three years into its hard-earned peace. They should do it not just for themselves but also for those who do not enjoy their status, who will never be heard if they speak up alone. This article was published in the Midweek Review on 11th July 2012. The internet version can be accessed here.